After France’s rebellion of the Yellow Vests turned violent last week during the fourth week of protest against the globalist, elitist government of Emmanuel Macron, this weekend’s protests (week 5) saw a further escalation in the protesters anger against the government, which they claim is a government for the rich and for foreign nations rather than the people of France. Well as this news site has always said, that is what globalism is all about. Again vast number of police, around 70,000 according to unofficial reports, have been mobilized across France in an effort to suppress the protesters, which the government says number 33,000, which would be a much lower turnout than in previous weeks could it be believed. Last week’s actual numbers of protestors was many times higher than government figures with more protests in French provincial centres, proving the old maxim that truth is the fist casualty of war. he Yellow Vest movement has now spread to several other European Union member states,notably Belgium and Netherlands, as well French speaking parts of Canada. There was even a small protest in London yesterday, and the British movement can be expected to grow as the full extent of the government’s betrayal of the Brexit vote emerges. Police used tear gas and pepper spray on protesters in the center of Paris today. One person reported received a head injury during clashes at Champs-Élysées but there are no reports of further serious bloodshed. A Russia Today correspondent suffered a facial injury and was taken to the hospital. 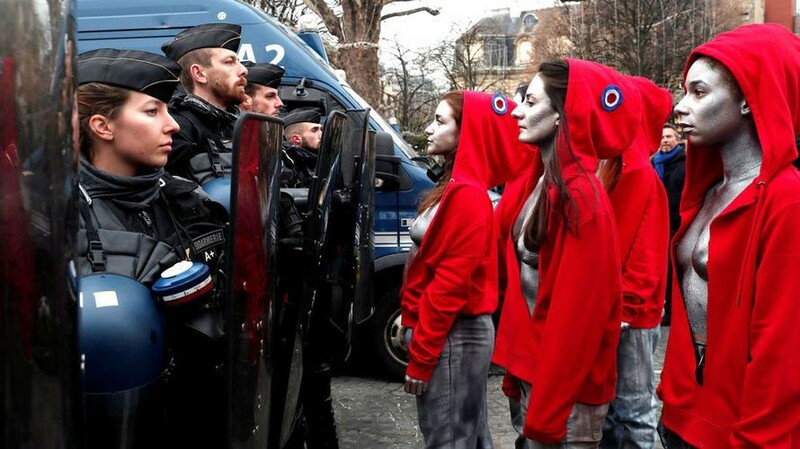 Donning blood-red hoodies and coated in silver paint, the women paid homage to the French revolutionary hero on Champs-Élysées avenue on Saturday in a silent demonstration. This signals a significant shift in the nature of the movement as Marianne is a hugely symbolic figure in France, representing the rejection of authoritarianism and the celebration of individual liberty. “Last time, we were here for taxes,” said 28-year-old called Jeremy told the AFP news agency. “This is for the institutions — we want more direct democracy,” he said, adding that people needed to “shout to make themselves heard”. Our girl in France, Cleo Hart reported that pictures on rolling news channels showed Paris looking ‘less yellow’ this Saturday as only several hundred people descended on the Champs Elysee, the avenue where the president’s official residence is sited and focus of previous protests. This may be because last week President Macron, fearing for his safety, had a helicopter standing by so nhe could escape and deployed the Gendarmerie, a branch of the French military assigned to the civil authorities, whose unrestrained thuggery was responsible for many of the injuries inficted on protestors. Amid a heavy police presence, an estimated 3000 yellow vests gethered in the avenue. This time a week ago the number of protesters was much higher and rallies resulted in heavy clashes. At least 92 people have been detained and 53 taken into police custody in Paris, police said. Toulouse and Bordeaux had some of the biggest turnouts in the country, with tens of thousands of demonstrators taking to the streets there on Saturday. In Toulouse, which saw violent clashes last week, the authorities have deployed Gendarmerie armored vehicles. Britain’s Foreign Secretary Jeremy Hunt has warned parliament risks causing “real social instability” like the scenes with the yellow vest protestors in France if Brexit is not delivered. The Foreign Secretary told MP’s they must be “very careful” not to “get out of step with where the public are on Brexit”. Political analyst John Lichfield likened the protest by the ‘yellow vest’ movement to Brexit and in particular Brexiteers who he describes as being “betrayed by decades of neglect”. Lichfield told Politico: “The Yellow Jackets fit a worldwide pattern of populist revolt against politics-as-usual, but with a very French accent.